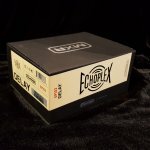 The Echoplex EP-3 tape echo unit is famous for its deliciously warm, organic modulation and sweet musical voice-a key component to some of the most iconic guitar tones from the `70s onward. The original EP-3 units, however, are expensive, temperamental, and larger than a VCR. That`s where the EP103 Echoplex Delay comes in. It`s the size of a Phase 90, and it delivers the EP-3`s legendary tones with a simple control interface and a hi-fi all-analog dry path. The Delay control sets the time between repeats-from 4 to 750ms-the Sustain control sets the number of repeats, and the Volume control sets the output level of your repeats. Where the sound of this pedal really shines, though, is in Age mode. By default, your pedal performs as a perfectly-calibrated, factory-fresh tape echo machine would- bright and clear tape with subtle wow and flutter modulation. A quick push of the Volume knob lets you "age" the sound of your repeats, darkening the tone, upping the tape saturation (distortion), and increasing modulation and tape distress as you turn the knob clockwise. The EP103`s delay signal gets the same tonal conditioning that the EP101 Echoplex Preamp provides, while the dry path is left untouched. For the full EP-3 experience, put that secret sauce on your dry signal by running the EP101 in front of the EP103. The Echoplex Delay also features tap tempo functionality, for up to 4 seconds of delay time, when you hook up an M199 MXR Tap Tempo Switch. The dry path is all analog with Constant Headroom Technology-providing a full 20 volts of headroom-and a choice of true relay or trails bypass. The EP103 can be set for 100% wet mode along with stereo input and output modes. No tape cartridges required!